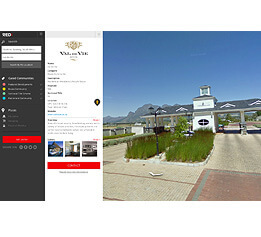 The Estate Communities Map has been created to showcase the most complete listing of gated communities in South Africa. 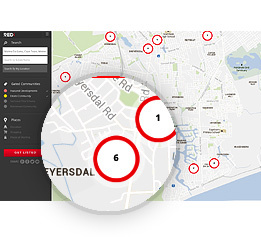 Those desiring to find a secure residential property development or estate to call home now have a resource which provides a map-centric way to locate and explore the ideal place to live. 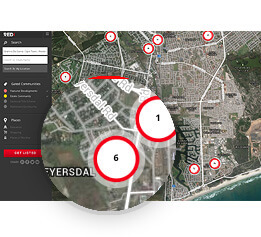 The map contains a comprehensive list of residential estates, sectional title schemes and retirement communities, which is constantly being updated and added to. 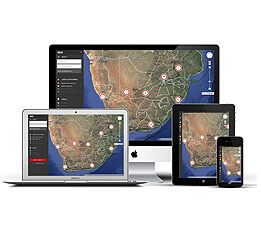 Search by area or by specific community name or by your current location. 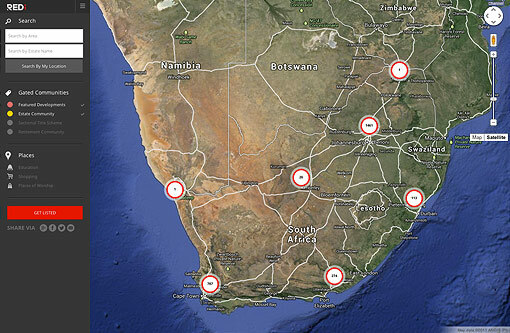 Your search results displayed in a Map view. Your search results displayed in a satellite view. View the geographic outlines of each community exactly as it is on the ground. 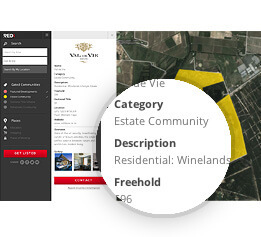 Including community name, type, property info, location and website link. 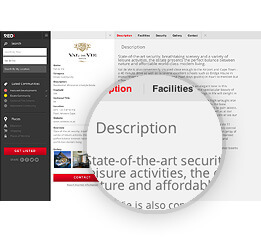 Including a community overview, list of facilities and amenities and security. A visual showcase of the very best of what your community has to offer. Drop directly into streetview and see what things look like on the ground. Leads and enquiries from the map are sent directly to the correct person. 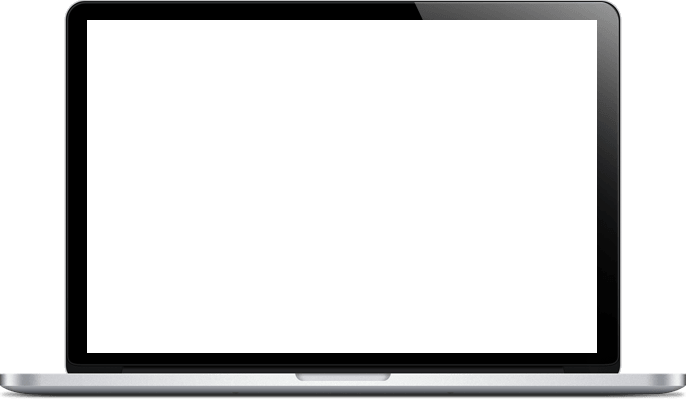 Responsively designed interface, accessible via multiple devices. 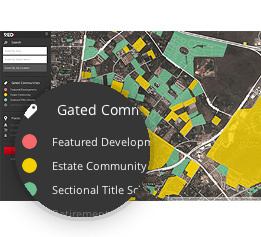 The Map displays a communities basic information such as name, development type, number of properties and geographic location. 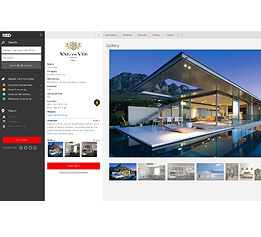 This can be extended to include more detailed marketing information such as a comprehensive overview of the community, the available amenities and facilities and security as well as a gallery of rich visuals to maximize the listing. 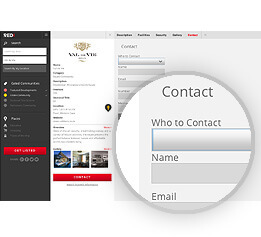 The contact form drives enquiries and leads directly to the correct person. The Communities Map is open to Developers wishing to promote new developments, Estate HOA’s or Body Corporates and marketing and sales teams wishing to showcase existing Estates or Schemes. Listing is free and includes a link directly to the Estate or Development website. 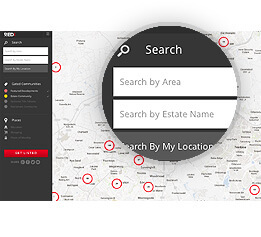 The Map is constantly being updated with the latest information to create a comprehensive resource of gated communities for property professionals, potential purchasers and investors.